Equilibar specializes in dome loaded back pressure regulator design and accompanying products. “Dome loaded” means that a fluid (usually a gas such as air or nitrogen) is fed into the top (dome) area of the back pressure regulator (BPR) to provide the pressure setpoint (also called reference) for the process. The pressure of the fluid in the dome is set by a secondary standard regulator called a pilot regulator. The pilot regulator can be manual or electronic, depending on the application’s requirements. We have a variety of pilot regulators in stock to control our BPRs. 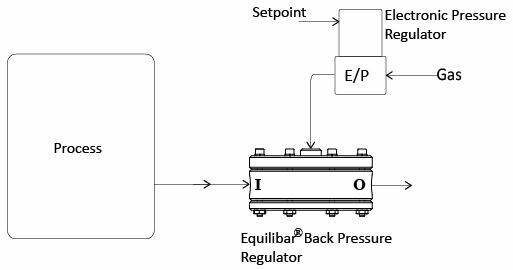 Below is a summary of ways to dome load an Equilibar back pressure regulator. For most applications, customers get good performance from applying a static pressure to the dome of the BPR. A manual air or nitrogen regulator with self-venting feature is typically used as a pilot regulator in this case. This setup is simple and robust, generally lower cost and works well where the BPR is located near the process. Equilibar has a wide variety of pressure reducing regulators in stock for this purpose. For computer automation, an electronic pressure regulator can act as the pilot regulator to supply the setpoint required to meet changing process needs. The computer can send a signal to the electronic pressure regulator, changing the process setpoint as required. The Equilibar BPR will react instantaneously to the change in setpoint. 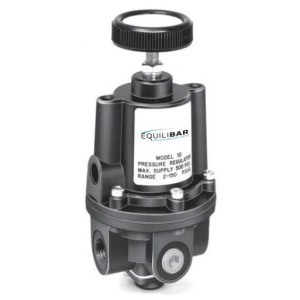 Equilibar has a wide variety of electronic pressure regulators in stock. For additional precision, a closed loop control setup can be used with the electronic pressure regulator to compensate for pressure losses inside our BPR or within parts of controlled process. By installing a pressure sensor directly at the point of desired control, the BPR will automatically compensate for a variety of losses and keep the process right on target. The PID control can be accomplished either inside the customer’s supervisory control system or by purchasing a 2-loop electronic pressure regulator. A process pressure sensor (PT) is required in either case. A mechanical pilot regulator may be used to compensate for pressure losses in the customer process and inside the regulator. By connecting tubing from the pilot regulator to the point of the process where precise control is required, it is possible to achieve higher precision and higher capacities than with standard open-loop control. Equilibar offers the RSV, remote sense vacuum pilot, to achieve this precision for our EVR vacuum regulators. For many applications, no air or nitrogen is available at the desired pressure range for a 1:1 dome loaded BPR. This is especially true above the commonly available air supply range of 100 to 150 psi. For fairly clean liquids and gases, the process media itself can energize a mechanical setpoint regulator to provide for convenient control. 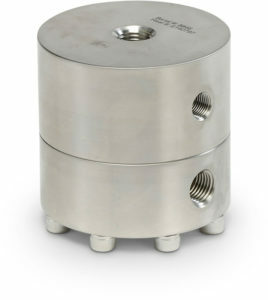 Equilibar has demonstrated this as a convenient method for supercritical CO2 pressure control. View our video to see how it works. Another method commonly used in the petroleum core analysis industry is to use a liquid pressure pump to supply the pressure on the dome of the BPR. Syringe-type pumps with integrated pressure control are commonly used in the core testing sector and can be deployed to control a liquid pressure equal to the desired setpoint. While Equilibar normally recommends a compressible fluid for best precision, many petroleum clients have reported good experience using hydraulic fluid to dome load an Equilibar BPR operating at pressures up to 10,000 psi (689 bar). DCI Test Systems is now offering a pressure controller that integrates directly with an Equilibar BPR for pressures up to 20,000 psi. Mity Mite BPRs from Grove traditionally used a static dome loading from the process inlet as a quick and easy way to generate the set-point pressure. In this method, the process gas from the inlet of the BPR is connected to the dome via a shut-off valve. As fluid begins to flow, the BPR remains closed and the pressure builds because the ratio of inlet/dome pressure is slightly higher than 1.0. The valve is shut when the process reaches the target pressure. A pressure gauge and venting valve may be included for improved operability. The Mity Mite contains an enlarged dome cavity to capture a larger dome volume, which aids in precision and in compensating for microscopic leaks over time. For Equilibar BPRs, a static gas volume (bomb) may be used to improve operability of this method.